In 1985, DC Comics published the first issue of Crisis On Infinite Earths, one of the first series ever sold on the explicit promise to “change everything.” This phrase has been mightily abused in the three decades following this series—and there were other Crises, many of them, both before and after 1985. But to this day, even after Zero Hour: A Crisis In Time, Identity Crisis, Infinite Crisis, and Final Crisis, Crisis On Infinite Earths still stands as the Crisis. Crisis On Infinite Earths became the ultimate by doing the one thing every subsequent Crisis has failed to do: It really did change everything. Before Crisis, DC had five decades of complex and often contradictory stories in play. Before 1985, there were multiple Earths: Earth-1, a timeline that began roughly at the onset of the Silver Age in the late 1950s, as well as was Earth-2, which was actually the first DC timeline, beginning with Action Comics #1 in 1938. The intellectual property of every company that DC acquired in its long and rapacious history had its own Earth as well—Fawcett, Charlton, and Quality. DC even had a designation for Earth Prime, which is this universe you’re inhabiting right now. This fictional multiverse made it difficult for DC to exploit each of its properties to their fullest. If you wanted to use Captain Marvel in a Justice League story, you needed an excuse for him to travel to Earth-1 from Earth-S. Still, there were many fans of the old system, and it’s a testament to the popularity of the concept that by the time of Crisis, multiple titles were taking place on both Earths-1 and -2. But DC wanted one Superman for all its titles and licensing, one Batman, and one Earth. Fans fussed and fought every step of the way, but when the dust cleared there was only one DC Universe, and everything significant from all the Earths had been consolidated onto a single planet. The timeline was relatively clean, sort of, and aside from a few early blips, things were relatively quiet. For a while. Just one year before Crisis On Infinite Earths, Marvel had unleashed its own massive event: Marvel Super Heroes Secret Wars. The final issue of Secret Wars hit stands around the same time as the first issue of Crisis, but the stories couldn’t have been more different. Crisis was filled with deep cuts from 50 years of DC history, with cameos from almost every character, some of them appearing—if only briefly—for what promised to be the last time ever. By contrast, Secret Wars was entirely self-contained. The most prominent heroes and villains from the Marvel Universe were kidnapped by an omnipotent alien and forced to do battle on the far side of the universe. The series was designed in such a way that any person off the street could pick up the first issue and immediately understand the thrust—here were Captain America and the Hulk and Spider-Man, and they were fighting Doctor Doom in space. Got it. Every event from DC and Marvel since 1985 has lived in the shadow of Crisis. Secret Wars, as well as its much-maligned sequel, Secret Wars II, were massive cosmic slugfests, but neither could match Crisis in terms of scale or consequences. The phrases “pre-” and “post-Crisis” came into use to delineate the moment where everything changed, and the DC Universe was never the same again. Marvel’s reaction to the success of Crisis has always been a slightly huffy assertion that the company didn’t need a Crisis in the first place. And to a degree this has always proven true: There are lots of different universes in the Marvel Multiverse, but only one main planet, good ol’ Earth 616. Over the years, Marvel has developed “Marvel Time,” a sliding timescale that places the entire history of the Marvel Universe since the first appearance of the Fantastic Four in 1961 within the last 12 years or so (barring the events of World War II, which remain moored in time). So while Captain America has always been awakened from suspended animation in Avengers #4, the events of that story have shifted from their original date in 1964 to roughly 2003. This timeline is messy, with definite glitches—Magneto’s concentration-camp backstory becomes increasingly problematic as time passes—but Marvel has maintained that these problems don’t bear much scrutiny, as the most important stories are always the stories yet to be told. Marvel creators use history as they please, as long as the new story appears generally consistent with what preceded it. Recently, Rick Remender retconned Falcon’s regrettable past as gang member “Snap” Wilson. This small, necessary change jettisoned a story remembered fondly by no one, in as painless and unobtrusive a manner as possible. These fixes usually pass with a minimal ruffle of feathers. The exception is the deal with the devil that reversed Spider-Man’s marriage in “One More Day,” a rough continuity patch that still rankles certain segments of fandom seven years on. But “One More Day,” much like the recent erasure of “Snap” Wilson, was done not to straighten out the sliding timescale, but to erase what Marvel viewed (rightly or wrongly) as an increasingly powerful obstacle to future Spider-Man stories. Despite this laissez-faire—and largely successful—attitude toward continuity challenges, fans have wondered (and feared) whether Marvel would ever have its own Crisis. If you’ve been reading superhero comics since you were little (and the loudest voices in these debates are always the lifers), the idea of change is profoundly, existentially terrifying. Crisis was a line in the sand. The Superman who premiered post-Crisis was a different character than the Supermen who had been published since 1937. DC wasn’t sending thugs door-to-door to tear up your pre-Crisis comics: They were still there, ready to be revisited at a moment’s notice. But at the same time, something essential was broken, even if the breakage was necessary. The idea that you can continue, perpetually, reading the same story that began whenever you started reading comics up until the present moment is seductive. Comic-book continuity gives us the illusion of stability that we lack in our own lives. In real life people die and don’t come back; you lose touch with friends and never see them again. So it’s comforting to assume that Spider-Man is still the same Spider-Man you remember from when you were 8. The advent of Marvel’s new Secret Wars—and specifically, this week’s announcement that the new series will begin with the “end” of the Marvel Universe—vindicates those who have been predicting a Marvel Reboot since 1986. So let’s pause a moment and tip our hats to Marvel for finally cashing in on what has to be its longest outstanding chit. Whether or not this turns out to be a full reboot or a mild tinker, Marvel has figured out how to turn decades’ worth of fan anxiety and fear into the kind of monstrous hype that you really can’t buy. Finally—or so it seems!—Marvel is pushing the panic button, breaking the seals, revoking the covenant… whichever apocalyptic metaphor you care to insert. Nothing will ever be the same again! Except that’s probably not the case. There will be changes, almost certainly. But rather than a reboot, the series will likely resemble a deck-cleaning exercise more than a complete refurbishing. The most likely and obvious result will be some kind of absorption of the popular elements of the Ultimate Universe into the mainstream 616. For many years Marvel has struggled with the Ultimate line, as the universe conceived as a streamlined alternative to the constant churn of the 616 was eventually weighted down with 15 years of its own baroque continuity. In Marvel’s desire to show that its characters could be successfully updated and reconceived for contemporary readers, it unwittingly created its own Earth-2. The last few years’ worth of Jonathan Hickman’s Avengers stories have led to this event, as the Avengers are forced into rival factions to face the threat of a multiverse literally crashing into itself, with potentially dire consequences for every living being. The plan for the new Secret Wars was supposedly laid out all the way back when Hickman first pitched for Avengers. This long-term planning has paid off: Over the last few months, a number of seemingly disparate threads from across the line have snapped into place. The situation with the time-lost original X-Men has become more and more entrenched, with a recent crossover (“Battle Of The Atom”) devoted to explaining the dire consequences. This, in turn, built off the ending of 2013’s Age Of Ultron series, which foreshadowed permanent negative effects to the Marvel Universe due to Wolverine’s tampering with the 616 timeline. The Spider-Verse event currently raging through the Spider-Man titles takes place against the backdrop of a crumbling multiverse, with the villainous Inheritors on one last hunt to exterminate the Spider-people. Suddenly every plotline in every book looks suspect, as fans begin to realize that anything—and everything—could potentially be up for grabs come May. During the recent press event, Marvel executive editor Tom Brevoort stated, “Once we hit Secret Wars #1, there is no Marvel Universe, Ultimate Universe, or any other. It’s all Battleworld.” Alex Alonso agreed, “The Marvel Universe will be Battleworld, and every single piece of those worlds will be building blocks for the universe.” Since the worlds that will be making up Battleworld are all either familiar alternate universes or new iterations of past storylines, elements like the “Age Of Apocalypse” or the adventures of a married Spider-Man could be part of these building blocks. Crisis ended with all the surviving Earths in DC’s cosmology merged into a new, singular Earth. 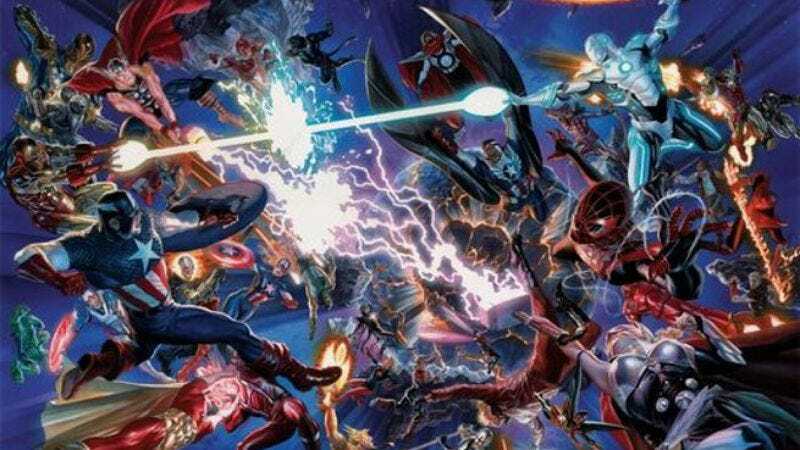 Marvel has consciously played to these expectations by making the Crisis’ most iconic visual—multiple parallel worlds colliding side-by-side—a subtle part of the promotional visuals for Secret Wars. They want fans to believe this is Marvel’s Crisis, because there’s every reason to expect that fans will show up in force to see what happens next. The one thing that explicitly hasn’t been promised, and about which Marvel has remained coy at every opportunity, is a reboot. Alonso, when pressed specifically on the question of a reboot, said, “We don’t expect all our moves to make everyone happy, but we think it will make for a really fascinating read through Secret Wars and beyond.” This remarkably ambiguous statement can be interpreted any number of ways by any number of scared fans. We can take a few things for granted. One year from now there will still be Spider-Man comic books, as well as Avengers and X-Men, although they will probably look different from how the books look today. And whatever Marvel changes can always be changed back one or five or twenty years later, just like DC did when it spent the twenty years after Crisis unraveling Crisis thread by thread, all the way up to the Hail Mary launch of the New 52. Whatever Marvel does, it almost certainly will not be as drastic as you fear. All the same, they’re counting on that fear to sell a lot of comics.